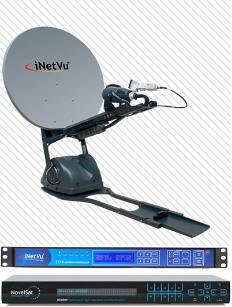 C-COM integrates NovelSat NS3000 modem with its iNetVu® 7710 antenna. Ottawa, April 2017: [Source: C-COM] C-COM Satellite Systems Inc., a leading global provider of mobile auto-deploying satellite antenna systems, has announced that it has successfully completed the integration of the NovelSat NS3000 modem with its iNetVu® 7710 antenna controller. The NovelSat NS3000 Professional Satellite Modem is the world’s fastest, most bandwidth-efficient satellite modem. “We are pleased to be able to provide the NovelSat modem integration with our iNetVu® products to our mutual worldwide customer base,” said Drew Klein, Director of International Business Development for C-COM Satellite Systems, Inc. “Additional approved and integrated hardware, especially a high-quality product like the NS3000, should create new markets for C-COM Driveaway and Flyaway antenna products in many different verticals,” Klein continued. "This new partnership with C-COM is a win-win-win, where Driveaway and Flyaway customers will benefit from the world's most efficient satellite bandwidth usage," said Efi Levinzon, NovelSat Chief Product Officer. "For C-COM, the NovelSat NS3000 adds the versatility to engage any existing network without replacing the satellite modem."